This entry has a two fold purpose. Therapy and catharsis which may be one of the same . I am one to believe that things happen for a reason and often someone is telling us to slow down. I have not been truly out of running for 3 years due to injury and the last time was post surgery where I knew it was happening. For the last 6 weeks I have had a flare up of one of my bunions I had operated on 3.5 yrs ago. I shoved it into my running shoes and off I went . Then I started to pad it and not more than a month later I noticed the skin starting to thin over a bursa that had formed . Well long story short I went down to Florida last week for a quick four day trip and was so looking forwards to running in the heat . The day after I got there with my foot red and sore I taped it up and went for a run. I got back and tore off the dressing and realized I had better get myself to a medical clinic as this did not look good. I will spare you the gory photo but I could basically see the tissue under the skin. Plus it was red, hot and certainly infected. $200+ later! battered and bruised and with antibiotics and painkillers in hand I left the clinic. Needless to say the rest of my trip was less than enjoyable . Being an athlete is a blessing and a curse. It’s great to feel that empowerment that fitness gives you. Having a focused goal and achieving those goals is also so fulfilling. As a wife, mother and physiotherapist it also gives me that identity for “me”. And it provides that outlet for my stress, my alone time and my maintenance of my body. Why is it a curse? Most athletes know that when this is all taken away from you and you have no control over timelines it is super frustrating. You lose all that I said above that made it a positive experience. Some people are able to take all this in stride and take it as a good opportunity to focus on other things, give their bodies a rest and move on. I have NEVER been that way. For me being injured turns my life into a tailspin ( yes I have sought help in past to deal with this!). I go from an organized efficient being to well, one who has little motivation to do all that I did B.I. ( before injury). This I need to work on. It starts with acceptance of the injury and knowing I will get back out there . I have always said, take any other activity away from me but not running. 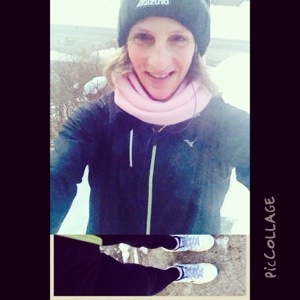 Running gives me the best feeling ever and it allows me to be outside even in the cold of winter ( polar vortex aside!) and I crave fresh air . 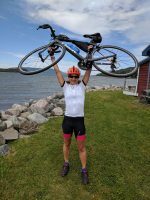 I feel most fit when I can run and right now I have two big goals ( an early April half marathon and a late June 70.3 where I am trying to qualify for the Worlds 70.3). From here on in I am going to do my best to accept my fate ( well it’s not all fate, I likely should have heeded the warning signs but with feet issues in past I consider it a condition vs an injury!….that’s the physio in me ). I am going to try my best to put a positive spin on it . I know I will be back running sooner than later as soon as the sores heal . I don’t have quick healing feet sores though…..bad circulation . Okay back to being positive , Elise. I will focus on my strength work, cycle ( but not four days in a row as I just did as I then made my ITB super tight!) , and hopefully be back in the pool soon. I will get into my work , help others to heal and try my best not to be grumpy with my family. So in lieu of the horrid photo I can post of my foot , I will post one from a past happy run ……. All blogs are nicer with photos! If anyone has other things that have helped them get through the hard injury times I am all ears…….Physios make the worst patients! Most never take their own advice.